Eggs: Whole Food Friend or Foe? I love to nourish the talent and crew of the WCHS 6 & WLBZ 2 Morning Report. 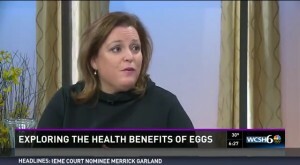 On Wednesday, I sat down with anchor, Katie Bavoso to talk about eggs. The health benefits of eggs. How egg allergies or sensitivities appear in your body and how to determine if eggs are your friend or foe… and you made find the answer is BOTH. Which eggs to buy when standing in the egg section of your supermarket.